Ohio buckeye, also known as American buckeye, fetid buckeye, and stinking buck-eye, Texas buckeye (var. arguta) derives its unflattering common names from the disagreeable odor that results when the leaves are crushed. The tree is an attractive ornamental, but it has limited commercial use as sawtimber because of the soft, light wood. Leaf: Opposite, palmately compound with 5 leaflets, oval to obovate leaflets are 3 to 6 inches long with a serrated margin, rachis about as long as leaflets, dark green above and paler below. Strong fetid odor when crushed. Strongly resembles its relative, the horse chestnut. Flower: Light yellow, in large, 4 to 7 inch, showy, upright clusters, stamens longer than petals, appear in spring. Fruit: Prickly, leathery husk enclosing usually 1 smooth chestnut brown seed (1 to 1 1/2 inches in dia) borne on a stout stalk and mature in fall. Damaging Agents- Ohio buckeye is relatively free of insect pests but the sapwood timberworm (Hylecoetus lugubris), the lacebug (Corythucha aesculi), the chrysomelid (Derocrepis aesculi), and the walnut scale (Quadraspidiotus juglansregiae) feed on buckeye. Ohio buckeye also has relatively few diseases. It is susceptible to a leaf blotch (Guignardia aesculi), which begins as brown spots or blotches on the leaves and may eventually involve all the leaves, giving the tree a scorched appearance. This disease may slow the growth rate but does no permanent damage to the tree and can be controlled on ornamentals. One of the powdery mildews, Uncincula flexuosa, also attacks the leaves of buckeye. 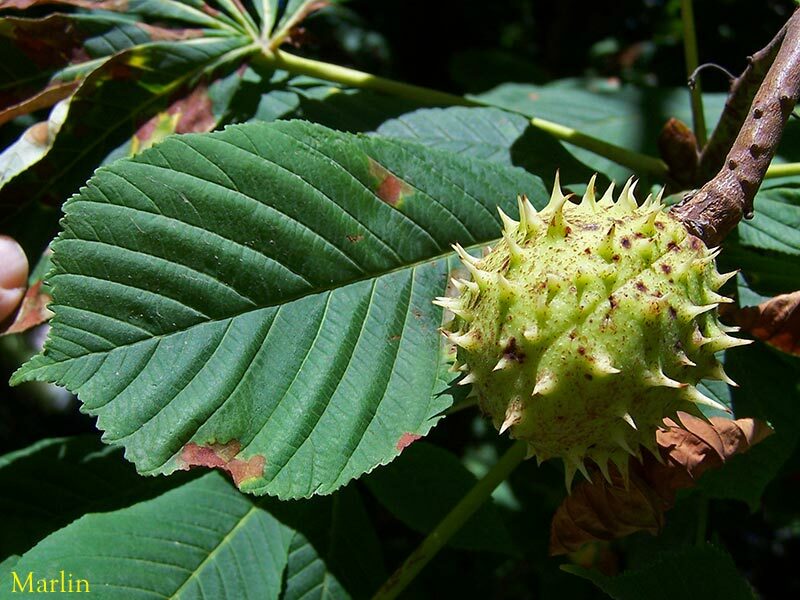 The seeds as well as the bark of Ohio buckeye are poisonous, and the Aesculus native to Illinois is known to contain a poisonous narcotic glucoside. The young shoots of buckeye are poisonous to cattle, and landowners in Indiana have exterminated buckeye in many areas. On the other hand, some buckeye seed are apparently eaten by squirrels. In Ohio, it constitutes from 2 to 5 percent of the food of eastern fox squirrels during the fall, winter, and spring seasons. Other studies in Ohio list buckeye as an auxiliary food that was sampled by squirrels in September but not eaten in quantity. Thus, it seems probable that the use of buckeye seed for food by animals is not a limiting factor in its reproduction. Fox squirrels in Illinois were observed eating the pith from terminal twigs. Buckeye pith contains 66 percent raffinose, a sweet-tasting 18-carbon sugar that is much sweeter and contains potentially more energy than sucrose. The wood is light and soft and is used for pulpwood, woodenware, and occasionally for lumber. Consisting of three genra a 15 species, this small family is sometimes lumped together with Aceraceae (maple) in family Sapindaceae. Many are native to Europe, Asia, and North, Central, and South America. By far the most familiar of this family (at least in America) is the Ohio Buckeye (Aesculus glabra).